Your oven's put to good use! I feel so silly. I was expecting a square cake with 9 pineapple rings. Then I realise, you can have it any shape you want. You've got the midas touch, all your first times turn out so pretty! The Martha Stewart one is square, with four rings, and mango to boot. The cake looks so pretty with the cherries and pineapples on top. Puts me in the xmas mood already. been meaning to get that nigella book but hmmm, must find time to cook (eventhough it's express)...haha! beautiful! 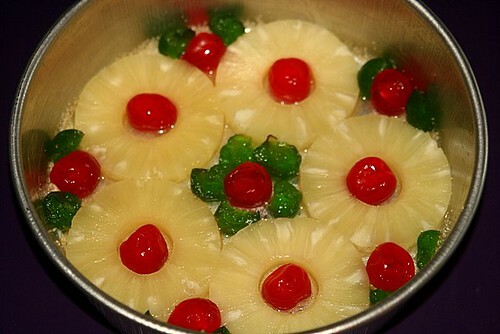 I'm not a fan of canned pineapple but this looks fabulous! 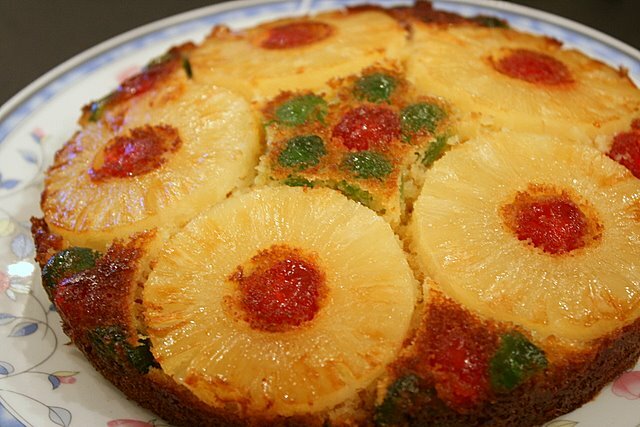 is it okay to use other canned fruits other than pineapple for this cake? p/s your cake looks awesome moresome!!! didally: bake it for xmas! Kenny: she does, doesn't she? I like that she's just like one of us, not a formally trained chef, but someone who loves to eat as much as cook. Nic: thanks! Get the book, it'll get you cooking in no time! BTA: yes, I would think other fruits would work as well. I was thinking of using sliced peaches too. Will try someday! Hi how do you mix your ingredient together? just stirred them altogether or use a whipper? The cake is awesome! The colours in writings are wonderful too. I love anything that has pineapple in it. I want to prepare the same for my son's birthday party. collaborating on a televised baking project I am working on? I couldn’t find any contacts to talk with you direct. If you are interested please email me at talya.stone100 AT googlemail DOT com.